This voucher is valid till 31st Dec 2017. 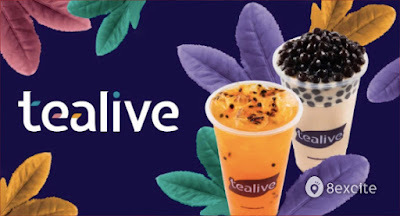 Present voucher at counter for a FREE CUP of Tealive drink worth RM6.50, 6% GST included. For drinks valued above RM6.50, you will be subjected to additional charges. Tealive will not replace lost, stolen or damaged vouchers. You will not be entitled to Bcard / Tealive Uni-Tea membership points when you use this voucher. Not valid with other offers, promotions and / or discounts. Not valid with Tealive Thursday promotions. This voucher is can only be used in a single transaction and should the value of the drink is lower than the voucher/s, no change shall be given. Tealive reserve the right to change the Terms & Conditions of this voucher at any time.